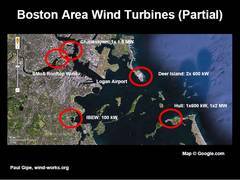 Boston and the communities around Boston Harbor have more commercial wind turbines than the entire San Francisco Bay, including one 1.5 MW wind turbine within Boston's urban core. Yes, it's a real wind turbine and not architectural bling like the VAWTs on the side of San Francisco's Public Utilities Commission building. There are two 600 kW wind turbines at the city's waste water treatment plant on Deer Island and of course there are the famous turbines in Hull. The IBEW has operated an 100 kW turbine for nearly a decade within the Boston area. In 2012 I gave a presentation in San Francisco on "Urban Wind." I was one of several speakers on the program and was chosen in part because I am a critique of so-called urban wind that's no more than greenwashing. Here's my presentation on real urban wind "on the bay."